The Restless Wanderer – My mantra is to go places and leave wonderful traces. It’s been a while since I wrote my last blog entry. Lethargy took over. Haha! Now I will share with you guys, the short but sweet stop I had in Switzerland. Most of you are familiar with the more popular cities in this country such as Zurich, Lucerne, Geneva and probably St. Gallen, since a recent Filipino movie just featured it. But there’s a hidden gem in the countryside. Interlaken lies in the Bernese Oberland on an alluvial plain, between Lake Thun and Lake Brienz. The vacation destination, which is presided over by the three mighty mountains, Eiger, Mönch and Jungfrau, is the starting point for numerous activities. Unlike Amsterdam and Paris, there are no tall hotels in this part of Switzerland, but instead full of homey and unpretentious accommodations surrounded by mountains and trees. We stayed at Alpenrose Hotel and Gardens which perfectly represents the Swiss life. Laid-back and relaxing. Expat Explore didn’t fail to warn us that it has no elevators and so we had to take our luggage via stairs. It was not a problem for me, and it didn’t became problem for our older people in the tour as well since someone was there to assist them. After we settled in our things and freshened up ourselves, the free dinner was ready at the restaurant. We all shared our first Swiss meal. Everyone needed to eat and rest well since it will be our free day the next day. I woke up around 7:30 AM the next day, quite late since I was in charge of my day. 80% of the group actually woke up early since they opted to take the Jungfraujoch Top of the Europe tour offered by Expat Explore. It was one of the choices they gave us to spend our free day. It’s basically a train ride that will take you to Europe’s highest train station with the chance of seeing snow and all. It’s not a cheap excursion but I still think it is worth a try for first timers. I just came from Armenia 8 months ago and was not really that excited to see snow again, thus I chose not to join the tour. Instead, I booked a FREE Interlaken Walking Tour from http://www.interlakenfreetour.com a few weeks before I left Dubai. Yes, you read it right, it was free. Our meeting point was at Balmer’s Hostel, which is 5-minute bus ride from our hotel. One of the cool things about Interlaken is that they provide free local transportation for tourists which is available at all hotels. I was at the meeting point 15 minutes earlier and the tour guide came exactly at 10:40 AM as agreed. We were around 12 people who joined the free walking tour. Some are as young as me, one is an old couple, a few girls from US and a guy from India. I guess it’s only proper to give commendation to our tour guide, Juliano. It was so nice of him to make an effort for the group to jive by introducing ourselves and sharing our hobbies and interests. The tour lasted around 2 hours, but I didn’t even notice it because all the places were just too stunning. All the spots were very rich in culture and picture perfect. It’s indeed a piece of heaven on earth. Walking the fields, trekking the mountain, indulging in the lakes, right there and then, I knew I made the right choice about this tour. Before the tour ends, everyone gave Juliano the gratuity that he deserves. To everyone who will be joining this free walking tour in the near future, please give generously. The last stop of the walking tour was at the Outdoor Interlaken Höheweg Shop which is just a few blocks away from the location of my next activity, chocolate making!!! For 69 CHF, that’s around 260 in dirhams or 3600 in pesos, I was able to book myself a 1-hr workshop inclusive of unlimited chocolate tasting. It was really an experience to remember since Swiss chocolates are very famous, not to mention very yummy! In general, I must say that Switzerland is really an expensive country. The basic necessities are much higher compared to other European countries. Imagine peeing using a public toilet for 54 pesos. Not cool! Haha. But mind you, their toilets may be considered public but it is very elite, clean and really well-maintained. If you want to go to Europe to relax and just take off your mind from everything else, Switzerland is the perfect place to be. So this will be my first restaurant review. I must inform you, I’m not the kind of person who spends so much for fancy foods. Everything I will write here is either I got for free or I availed from Cobone or Groupon. Haha! I will start with my experience at Sugar Factory. I believe it has 3 branches here in Dubai. One in La Mer, another in Dubai Festival City and the one where I dined in, the City Walk branch. It is an American restaurant but in contrast with it’s name, it doesn’t only offer sweets and desserts, it actually has a huge variety in the menu. My voucher is worth 300 AED, that’s almost 4,300 pesos worth of food. But of course, I will not spend that much for one dining, I bought it at half the price. Hihi! The facade looks really cool and the place is quite big. It has outdoor and indoor seating also. I arrived there in time for dinner. The staff, which are mostly Filipinos, said that they usually becomes full around 8PM. True enough, there were numerous vacant seats when I reached. I preferred to seat inside because I was so curious about it’s interior. It has a separate corner for their very own candy store. It has also big framed photos of Hollywood celebrities who visited their store in the US. The place looks spacious because the ceiling is high which creates that illusion. Now, let’s talk about the main event – the food. I ordered their famous rainbow sliders, chicken pot stickers, tamarind chili shrimp wok, calamari rings and their trademark milkshakes. A homemade chicken dumplings steamed and tossed in a lightly spiced soya chili glazed served with a hot and dipping sauce. Verdict: It tastes exactly like the yummy authentic Chinese dumplings but the down side is the wrapper, it’s overly firm that slightly spoils it. But over all, it is good. Among all the food that I tasted, this one is my favorite. Grilled angus beef patty, grilled chicken, buffalo chicken, fried fish and fried chicken each served on Sugar Factory logo colored buns with lettuce, tomato and special sauce. Verdict: The colorful buns are pleasant in the eyes, but not really in the mouth. I totally ignored the bread and went directly to the meat. It was okay. Gulf shrimps, tamarind chili sauce, fresh red chilies, and yellow capsicum. Verdict: “I can cook this better.” – Yes, that’s exactly my reaction after tasting it. Na-a!I don’t recommend this at all. Crispy fried calamari rings served with sugar factory special sauce and tartar sauce. Verdict: Without the tartar sauce, it’s totally bland. The only saving grace is the fries. It always saves the day anyway. Vanilla ice cream blended with peanut butter and topped with whipped cream, peanut bar, waffles, unicorn lollipop and chocolate covered mug dressed in sprinkles and peanut butter cup. To sum it up, I feel like there’s nothing really special about their food. Thus, it seems a little over priced for me considering the quality of the food, the ones at least I ordered. The serving amount was satisfactory, I had enough for take away. The whole experience was still nice.I must commend the staff who were very attentive and pleasant. They were also honest to suggest to order more to maximize my voucher. I believe that every restaurant is worth a try, at least once. So if you get to stumble a discounted voucher for Sugar Factory, go grab it. It’s still worth a try. When asked about their dream destination, I think most people choose Paris as answer. It was definitely in my checklist too. I wanted to see for myself what everyone is talking about. But more over, I was so excited to tick off my 2nd Disneyland! I hope to be able to go to every Disneyland in the world. We reached Paris a little over 4PM. Our tour leader decided to drop us off first at our hotel to quickly freshen up and leave our bags. We stayed at B&B Hotel Porte des Lilas. It was quite far from the city centre, but it’s convenient because it is just a 5-minute walk away from Porte des Lilas metro station which will bring you to anywhere in Paris. It was basic but neat. We also didn’t need a card to access the room, all we had was a pass code. So cool! After dinner, everyone chose to head back to the hotel. We all knew how long the the next day is gonna be. It’s a free day for everyone so we all had our own itinerary. I woke up the next day at 5:30 AM. Sounded like I woke up for work but really, the day will be that long. The hotel buffet breakfast was basic. But as the tour went by, I realized that for us Filipinos, European breakfast will always be basic. Bread, jams, pancakes, egg. No fried rice, longganisa, tapa, tocino, BASIC! Haha! But in all fairness, it was really decent enough to fuel you for the whole day. First thing in my agenda was to see the Eiffel Tower up close early in the morning. It was still quite dark when I left the hotel. The metro station was just a few minutes walk. Their train stations are old though I can say that it is still efficient. The train lines were easy to understand and follow. From the train station, I walked a few blocks to reach the famous landmark of the city. As I was walking towards it, it felt so surreal. I used to see it only in photos, magazines and books and that time, I was actually in front of it. I have always dreamed of roaming the world, but it’s still a different feeling when you are already there. I just let myself drown in the moment, stared at it and took some photos and left. My next goal was to see Arc de Triomphe. It is one of the popular monuments in Paris. It honors those who fought and died for France in the French Revolutionary and Napoleonic Wars, with the names of all French victories and generals inscribed on its inner and outer surfaces. Just across Arc de Triomphe is probably one of the most recognized avenues in the world, Champs-Élysées. It’s a 1.9 km stretch of prominent luxury shops, restaurants and theaters. The biggest Louis Vuitton shop is actually located here. Another thing that fascinated me was Palais Garnier. It’s a 1,979-seat opera house, which was built from 1861 to 1875 for the Paris Opera. The whole architecture made me swoon. Also one of the limitless tourist spots here in Paris is the renowned Louvre Museum. Tickets must be booked online prior to avoid the very long line. I’m not an artsy person but it was just so surreal seeing the original Leonardo Da Vinci’s Mona Lisa painting. I was also able to visit Notre Dame. According to Wikipedia, it is a medieval Catholic cathedral on the Île de la Cité in the fourth arrondissement of Paris, France. The cathedral is widely considered to be one of the finest examples of French Gothic architecture, and is among the largest and best-known Catholic Church buildings in the world. Indeed, the landscape of this church is jaw-dropping. I couldn’t help but gaze at it the whole time I was there. Lastly, my Paris trip won’t be complete without a Disneyland visit. I can vividly remember my Hongkong experience. I literally cried during fireworks because it was just so moving. I promised myself that I will do my best to be able to visit all the Disneyland in the world. It rained during the parade, but nonetheless it was still very amusing. Just like a child, I enjoyed every minute of it. I even wanted to ride It’s A Small World twice. Haha! I’m not sure if it was because it’s autumn but the park closed at 8PM that day so the firework schedule was early. It was astonishing to hear French Disney songs but no matter what the language was, it still brought me the same feeling as the first time I witnessed it. 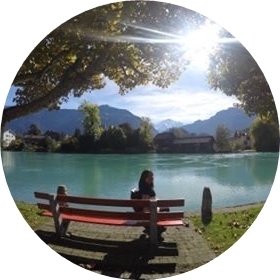 As mentioned in my previous post, I joined Expat Explore for my Europe tour. During my last night in Amsterdam, I met the group which was headed by our lovely tour guide, Lish. We assembled at Hamptons by Hilton hotel which was also our home for the first night of the tour. So the next day after the early breakfast, we gathered in front of our coach for our first destination, Brussels. It was just actually a short visit en route to Paris. The ride from Amsterdam to Brussels was 2 hours, more or less. Our first stop? The Atomium! As per Wikipedia, it is a landmark building in Brussels, originally constructed for the 1958 Brussels World’s Fair. It is located on the Heysel Plateau, where the exhibition took place. And now, it has become a museum. We did not go inside since it was just a quick stop over. On our way to the main attraction, I was able to take some shots of the city. It’s very simple and unassuming. The weather during that time was very gloomy that added more drama in the background. But when I finally laid eyes on the Grand Palace, everything just turned so magical. It felt so surreal. It’s like seeing the whole Europe in one frame. My photo won’t do enough justice to describe it’s majesty but believe me, it was quite perfection. The Grand Palace is the central square of Brussels. It is surrounded by a town hall, a beer museum and a collection of restaurants and souvenir shops. It is also the home of numerous festive and cultural events of Belgium. A few steps away from the main square is also one of the tourist spots in Brussels, the Mannekin Pis. It’s a cute small bronze sculpture depicting a naked little boy urinating in a fountain’s basin. They say that it embodies the sense of humor of the people of Brussels and their independence of mind. But just like all the other places, the one thing that always makes the difference is the food. Waffles, fries and chocolates — everything Belgian! Taking pride of these popular treats, they made sure that you can just buy everything in every corner. Sugar waffles are available for 1 EUR and the rest depends on the flavor. It was fun being surrounded by colorful waffles. Happiness! Brussels is a combination of simplicity and grandeur. Even if you only have a few hours to spare, the aesthetic of this city will fill your soul with so much peace. It’s the place where you can just sit all by yourself and will never feel alone. Oh, that feeling that Brussels brings. After a full day drifting the electrifying city of Amsterdam, my next plan was to visit the countryside. Nothing beats nature and we all deserve the quiet side of that crazy city. Unlike what I did in Amsterdam where I chose to do the tour alone, I decided to take a Holland Day Trip from Viator. I just thought that it will save me a lot of time since there’s really no concrete means of transportation in moving from place to place. The day trip costs 109 EUR inclusive of lunch. The local operator was Tours and Tickets and they have their office just around Amsterdam Central. It is also the meeting point for all their tours. The departure time of my tour was 9:45 AM. I made sure that I was already in the meeting place 45 minutes earlier. If you know me, you know that I’m very particular with time. Lol. I was lucky enough because there’s Mcdonalds just beside the meeting place. Mcdo breakfast is life! The tour covered villages and towns like Edam, Marken, Volendam and Zaanse Schans. Our first stop was Edam. This town is like a piece of heaven on earth. Our tour guide led us to an informative walking tour around the town’s charming churches and famous former shipyard. Combined with Edam is Volendam which forms the municipality of Edam-Volendam. It is well known for its old fishing boats and traditional clothing still worn by some residents. We headed to a local cheese shop which I really enjoyed. Being a cheese lover, cheese tasting was unarguably the best part. It was my first time to see a green cheese, which is surprisingly pesto flavored. But my most favorite discovery is the Mosterd Dille Dip. Google and try it. So good with cheese, I had to buy one for home. We also went went to a Stroopwafel Museum which is also around the vicinity. It is a waffle made from two thin layers of baked dough with a caramel-like syrup filling in the middle and it’s very popular in Netherlands. A local Dutch lady showed us how to make one and of course, free stroopwafel for everyone. Yuhooo! After satisfying our taste buds with all the free taste, our group was gathered again by our tour leader. Then we were off to our next stop, Marken. It is the traditional fishing town famed for its preservation of Dutch culture. For us to get there, we needed to climbed aboard a boat. Along the way, we were able to witness the stunning views of Lake Ijssel. Upon arrival, quaint boutiques and picturesque harbor of the fishing village welcomed us. We were not able to explore much of it since we had to convene again for lunch. The tour included a lunch at a local restaurant which was just in front of the harbor. De Visscher Taverne is a traditional diner tucked in this scenic calm village. The interior reflects so much of the Dutch culture and the staff was very nice. The last stop of the tour was the province of Zaanse Schans. It is one of the famous attractions in Netherlands because it has a collection of well-preserved historic windmills and houses. It’s actually surreal to see these windmills in person. We also had the chance to see first hand how it works. Really fascinating! Historically, it has served many purposes but the most important was pumping water out of the lowlands and back into the rivers so that the land could be farmed. It was only restored for viewing and has become one of the tourist spots of the province. Before the ride back to Amsterdam, we were dropped to some local souvenir shops where they also demonstrated how to make their customary wooden shoes known as clogs. I am familiar with clogs because I once used it during a United Nations school program when I was in Kindergarten. Haha! I did not think that it still exists. Some locals were actually wearing it during our tour. After the last activity, we moved to the coach and comfortably sat our way back to the city. So finally, I decided to take the first step in creating a travel blog after a few years of laziness. All my friends are telling me to start a blog since I love travelling and going places. So now, my first entry will be my most recent escapade, a legit 5-star staycation which I got for FREE. Yes, you read it right, a 3-night stay, a Turkish Hammam treatment, and a buffet dinner, without paying anything. How did it happen? So April last year, I joined the Conde Nast Traveller magazine contest “Where are You?”. Basically all you have to do is guess the specific location of the picture. A month after, I received an email from them that I won and voila, I got all those freebies I mentioned. Thanks again, Conde Nast! I decided to use the vouchers for my 30th birthday. Since I don’t want to spend a few bucks for a cab going in the farthest side of The Palm, I took advantage of the free shuttle which is at the Ground Parking of Mall of the Emirates. Guys from the reception are very courteous. I did not feel a bit of discrimination, yes I am expecting it, since I have a gift voucher. Fortunately, they were still very warm and accommodating. They even upgraded my supposedly Deluxe Room to a Premium Room with Sea View. How lucky can I get, huh? I had a few requests, and the Housekeeping were very quick to respond. I really love their service. It’s very commendable. The next day, I woke up to a sumptuous buffet breakfast at their all-day restaurant, A La Turca. So much options, not to mention the cool donuts world corner. I was taken by a lady who was wearing a swimsuit, and I was like, “Ate, what will happen? Why are you in a swimsuit?” She just smiled at me and the rest is history. Lol. I can’t find the perfect words to describe it so let me just copy paste from Wikipedia. “A Turkish bath (Turkish: hamam, Arabic: حمّام‎, translit. ḥammām) is a type of public bathing associated with the culture of the Ottoman Empire and more widely the Islamic world. A variation on it as a method of cleansing and relaxation became popular during the Victorian era, and then spread through the British Empire and Western Europe. The buildings are similar to the thermae (Roman baths). Unlike Russian banya, the focus is on water, as distinct from ambient steam. The process involved in taking a Turkish bath is similar to that of a sauna, but is more closely related to ancient Greek and ancient Roman bathing practices[why?]. It starts with relaxation in a room heated by a continuous flow of hot, dry air, allowing the bather to perspire freely. Bathers may then move to an even hotter room before they wash in cold water. After performing a full body wash and receiving a massage, bathers finally retire to the cooling-room for a period of relaxation.”So there. Hahahaha! After breakfast, I went on as planned. Swim swim swim and sun sun sun. It was already late afternoon when I decided to go up to my room. When I walked through my room, the best part of my stay was at the table. It melted my heart, really. It was a simple gesture by Rixos but I really appreciate it. I did not expect this since I know that I am not a paying guest. But they still made me feel special on my big day. Thank you thank you! I have nothing but good words for Rixos The Palm. Indeed, they gave me a 5-star kind of service all through out. You have no idea how special you made me feel. I don’t know for sure if I will ever get to experience this again, but I’m just so happy I did. One for the books! But again, this won’t all be possible without Conde Nast Traveller magazine. Hihi!